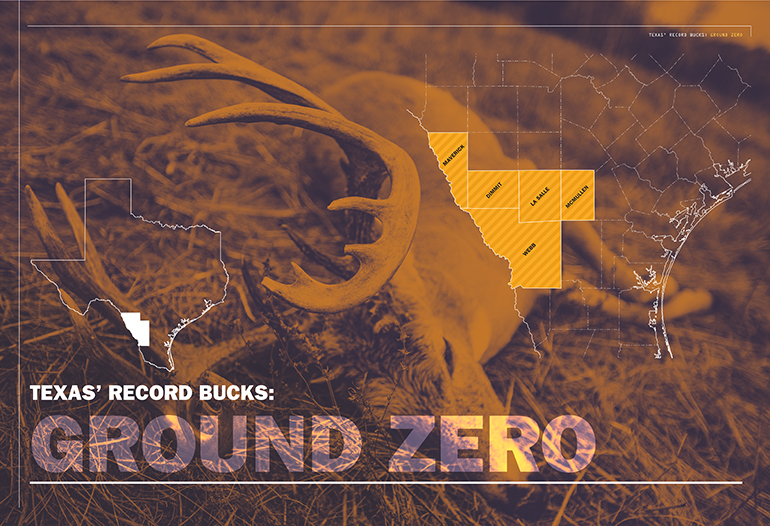 A large portion of the state’s Boone & Crockett bucks in the past five years came from five counties in South Texas. Here’s how to get in on the big-buck action down south. While that advice may have helped westward expansion across our great land, the same advice doesn’t hold true for deer hunters looking for big bucks in the Lone Star State. In fact, when it comes to giant Boone and Crockett Club-sized whitetails here in Texas, you might want to point the pickup truck or Suburban to the south down Interstate 35! A look at the most recent edition of the B&C all-time record book bears this out. And so too does a look at the most recent record trends to come from the Lone Star State since 2013. Both show that many, if not most, of Texas’ B&C bucks come from a few counties in South Texas. These hallowed counties — often described as the Brush Country to the south of San Antonio — include Dimmit, La Salle, Maverick and Webb counties (which produced 13, 13, 13 and 17 B&C bucks over the past five years) as well as McMullen County (which produced 4 B&C Bucks). While other counties have produced recent Booners — including the Panhandle’s Hemphill County (4); North Texas’ Red River Valley group of Collin (3), Cooke (3), Fannin (2) and Grayson (1) counties; and Val Verde County (3) near Del Rio — it’s clear that South Texas remains the proverbial ground zero for record-book bucks in the Lone Star State. With this duly noted, how does a hunter go about accessing some prime South Texas hunting ground covered with mesquite trees, prickly pear cactus and Land of Giants whitetail bucks carrying big sets of antlered headgear? Believe it or not, there are actually three distinct possibilities available to hunters each year — so read on! In Texas’ vast territory that covers more than 268,000 square miles, some estimates place as much as 96 percent of the state’s landmass under private ownership. That means that, generally, unless you have a family member or friend who grants you access to hunting ground, you’ll typically pay for the privilege to unlock a ranch gate in the Brush Country. For many, that means leasing hunting property in the land of Muy Grande whitetails. 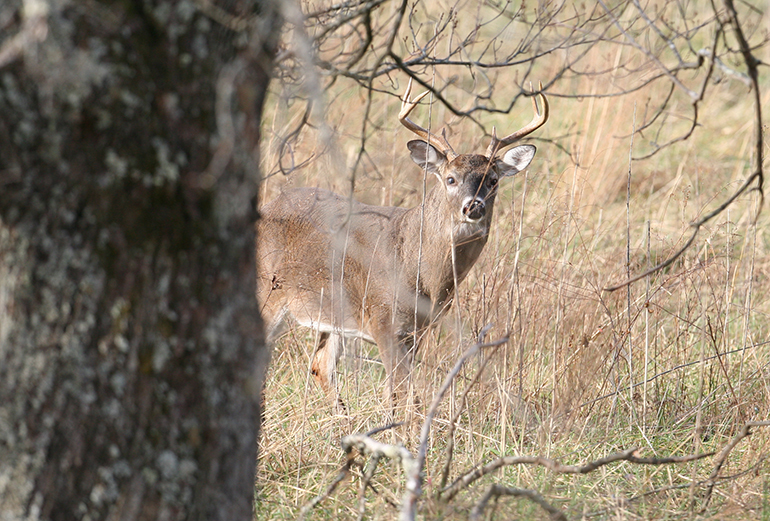 While private hunting leases have dominated the deer hunting culture of Texas for many years now, that doesn’t mean that it’s easy to find one. In fact, actually locating a solid long-term lease can be the most arduous task facing wannabe big-buck hunters in the region. How can you crack the private land code? First, determine what you’re wanting to accomplish — to simply secure some hunting ground, to find a lease project where you can improve the habitat and grow your own big bucks, or to secure a ready-made big-buck paradise already equipped to spit out monster racks of calcified head bone. Next, figure out what type of lease you want. Maybe you desire to assemble your own group of family, friends and hunting acquaintances on a new lease. While it’s not impossible to find some virgin hunting ground, realistically, such spots are exceedingly rare in South Texas. Most likely, you and your hunting buddies will end up opting to fill open spots that pop up on already established leases in the region. Either way, be aware that lease costs are high anywhere in Texas, particularly in the pay-to-play region of South Texas. In general, expect to pay big dollars per acre, something that translates into several thousand dollars each year per hunting spot. While an occasional friend-of-the-family bargain rate around $2,500 to $3,500 may be found by a lucky few, look to shell out somewhere between $4,000 and $8,000 per gun each year, and maybe even more for the most premium properties. After this initial homework, start scouring all leads for a potential lease. From calling local chamber of commerce offices to checking online and newspaper classified ads to browsing hunting forums and chat rooms to using a lease-finding service, there are many ways to look. Utilize all of them, including the lease listing page on the Texas Parks and Wildlife Department’s (TPWD) website. Remember that setting up a few thousand acres to chase whitetails in South Texas’ Boonerville Country is a time- and work-intensive effort. The region is remote and several hours from nearly every Texas city other than San Antonio. And that doesn’t include costs that go with camp setup, the placement of hunting stands and feeders spitting out corn and/or protein, and even maximizing your acreage’s big buck potential with drought-resistant food plots or agricultural crops. Finally, keep in mind that big deer are considered a cash crop in South Texas, meaning high fences are a persistent reality here. Such land typically costs more to secure, and bucks taken on such properties violate the Fair Chase code of the Boone and Crockett Club. Simply put, that means any buck taken on high-fenced acreage of any size will not be eligible for admission into the B&C record book. If leasing is one way to access South Texas hunting ground, another is choosing a hunting outfitter offering big buck hunts on an established ranch. Finding an outfitter is a bit easier than finding a lease, as many outfitters can be discovered through simple online searches. Many outfitters also set up camp each summer at hunting shows like the Sportsman Channel Outdoor Fest in Houston or the Texas Trophy Hunters Association’s annual Hunter Extravaganza gatherings in several cities across the state. Like the leasing option, expect to pay a premium for hunting on the best ranches in South Texas, especially when a Booner buck is the goal rather than a management buck in the 130- to 150-inch class (many outfitters charge a per-inch premium when a buck above the B&C minimums gets tagged by a hunter). Bottom line, many good outfitted hunts will cost between $5,000 and $10,000 for a week of hunting, perhaps more. While expensive, this is truly a turnkey kind of hunt where you simply show up at an established ranch, climb into a hunting stand with your guide, and hope that the buck of your dreams walks out into the sendero. How about hunting for big bucks in South Texas for a more budget-conscious hunter like yours truly? Well, believe it or not, such possibilities exist thanks to several Wildlife Management Areas (WMAs) conducting special draw hunts through the public land hunting program of TPWD, along with some hunts offered on federal land in the region. Such TPWD public hunting ground in South Texas includes gun hunting and archery hunting draws for various deer hunts at the 787-acre Las Palomas WMA – Arroyo Colorado Unit in Cameron County; the 1,700-acre Choke Canyon State Park North Shore Unit and its sibling South Shore Unit in Live Oak County; the 34,000-acre James E. Daughtrey WMA in Live Oak and McMullen counties (which also offers some E-Postcard Archery Hunt opportunities); and the much coveted 15,200-acre high-fenced Chaparral WMA in Dimmit and LaSalle counties. Remember application deadlines are in August and early September each year on the TPWD website. Demand is high, permit numbers are low, and standby hunting options are limited for these November-January draw hunts. But because there are some legitimate monster bucks in some of these units, applying isn’t a choice if you dream of a huge public land buck from South Texas. In addition to the TPWD-admin-istered hunts above, draw hunts (for archery, rifle, shotgun or muzzleloader) are also offered at several National Wildlife Refuges in the South Texas region, including the Lower Rio Grande Valley NWR – East Lake unit, the Lower Rio Grande Valley NWR – Teniente unit and the Laguna Atascosa NWR. Deer hunting options can also be found near Del Rio’s Lake Amistad at the National Park Service’s Amistad National Recreation Area. See the refuge or recreation area’s website for specific draw information and deadlines, hunt costs and pertinent hunting regulations. While permit numbers are low in nearly all public land options across South Texas, someone draws these permits each year. It might as well be you. Add in the fact that sometimes preference points are awarded to unsuccessful applicants (which increases your drawing odds in subsequent years) and that occasional standby hunting opportunities exist when currently drawn hunters don’t show, and there is a legitimate chance to take a big deer on public ground in this fabled part of the state. So, get in line, draw one of the available South Texas public hunting permits, put in some ample scouting time, and hunt hard when your hunt segment arrives, and maybe, just maybe, the big buck of your dreams will show up in front of your stand. And who knows? If a Muy Grande buck does just that, maybe you and your big whitetail will be featured in a future issue of Texas Sportsman, proving once again that whether it’s on public or private ground, South Texas is truly the Land of Giants! Owner: Buckhorn Museum and Saloon, Ltd.